Our Group is a Special Group. At present we have around a dozen Special Scouts. Our numbers are growing slowly and we welcome new members. We plan our program along Scouting principles, with the usual camps and hikes and cooking on the fire, whilst bearing in mind that our members have special needs. We meet from 7:00 pm to 8:30 pm on Monday nights during school terms. We are very grateful to 1st Lindfield Scout Group for the use of their Hall in Slade Avenue. Nobody has more fun than we do!!! We also enjoy the occasional Sunday outing, such as our trip to Cockatoo Island last November (see below) and the annual Agoonoree, a 3 day camp run by Scouts NSW's Special Needs Team. 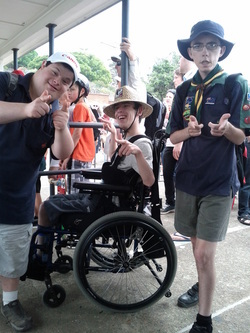 At the Agoonoree activities include special needs Scouts and able-bodied Scouts and it always the high-light of our year. Here we are at Cockatoo Island in November 2011, Adam and Daniel and Matt! It was cool!